Let’s create some enemies to fight, and their behaviour in battle, using Battle AIs. The Battle AI will decide the battle actions of any combatant who’s not part of the player group (or an AI controlled member of the player group). You can learn more about battle AIs in this how-to. For a fighter combatant using physical attacks. For a magician combatant using magical attacks. For a supporting combatant using support abilities. 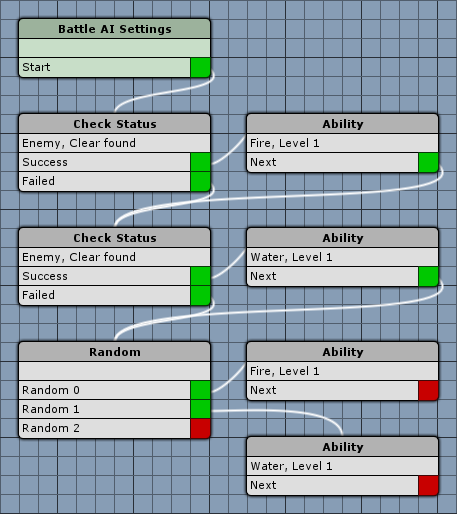 Open the ORK Framework editor and navigate to Battle System > Battle AI. This simple AI will have a 5 % chance to do nothing at all, and use Boost on the user if it’s not applied. Since a combatant always uses it’s base attack if no battle AI found an action, we don’t need to tell this AI to use the base attack (it would be different if you want to use the base attack on special conditionts, like on an enemy with less than 10 % HP). This is how the AI will look like in the end – I’ll just assume that you know how to use the node editor by now and simply describe the settings of the different steps. We want this step to check for a 5 % chance and executes the None action if the check is successful. Else, the Check Status step will be executed. This step will result in the combatant doing nothing – the battle AI will end. No further settings. This step should check if the status effect Strengthen isn’t applied to the user. If successful (i.e. Strengthen isn’t applied), Boost (ability action) should be used. This setting decides what’ll be done with targets found by previous conditions. Since we shouldn’t have any previous targets here, this setting doesn’t really matter, but let’s clear them anyway to be sure. If we don’t clear the targets, all targets already found would also be used as possible targets by actions used after this step. This checks the user of the battle AI for the condition. We’ll only have one condition, so this setting doesn’t really matter now. A status requirement should already be added – else click on Add Status Requirement. We want to perform Boost. That’s it for this battle AI. This battle AI is a little bit more complex. It will check enemies for weaknesses to Fire and Water attack attributes and use according abilities. If no weakness is found, the used ability will be selected randomly. This step should check enemies for a weakness to Fire (in our case, Fire > 100). If the check is successful, the ability Fire should be used, else another Check Status step. Performs the ability Fire. 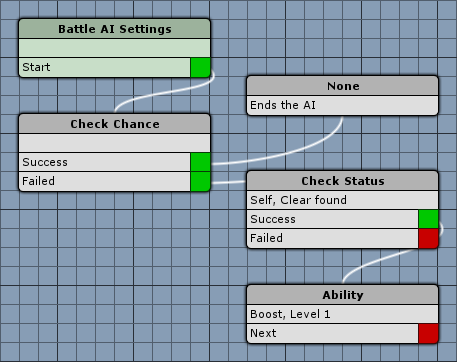 If it can’t be used, continues the battle AI with the next Check Status step. This step should check enemies for a weakness to Water (in our case, Water > 100). If the check is successful, the ability Water should be used, else a Random step. Performs the ability Water. If it can’t be used, continues the battle AI with the next Random step. This step should randomly execute either Fire, Water or the combatant’s base attack (by having no next step). So we need three next steps – click on Add Step twice to add two new steps to the random step. Copy the previously used Fire ability step and connect Random 0 to it. Copy the previously used Water ability step and connect Random 1 to it. Leave Random 2 unconnected. We can’t simply connect the random steps to the previous ability steps – this could create an eternal loop if the ability can’t be used. This battle AI will check allies and enemies for certain status conditions and uses abilities accordingly. This step should check if the HP of any ally of the user is below 50 %. If successful, Small Heal should be used, else the next Check Status step. We want to perform Small Heal. If it can’t be used, continue with the next Check Status step. This step should check if the status effect Strengthen isn’t applied to any ally of the user. If successful, Boost should be used, else the next Check Status step. We want to perform Boost. If it can’t be used, continue with the next Check Status step. This step should check if the status effect Weaken isn’t applied to any enemy of the user. If successful, Lessen should be used, else the next Check Status step. We want to perform Lessen. If it can’t be used, continue with the next Check Status step. This step should check if the status effect Poison isn’t applied to any enemy of the user. If successful, Poison should be used. We want to perform Poison. That’s it for the battle AIs. A fighter using physical attacks. A magician using magical attacks. Navigate to Combatants > Combatants. We’ll first add a single new combatant and copy him later to create the others. Change the following settings. Can be found in Assets/Tutorial Resources/Prefabs/Combatants/. We don’t need a special class for our enemies, at least not yet. The status values of a combatant can either be set to a fixed value in the combatant’s settings, or you can use status development like for the player’s combatant. 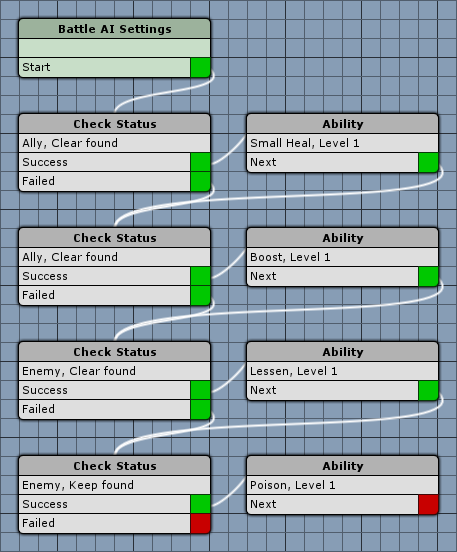 For our simple game, we’ll create only static enemies with fixed values. With this setting enabled, you’ll be able to define the status values without going through more complex development settings and curve generation. Now, you’ll be able to set the Normal and Experience type status values. The Experience type status values will define how much experience is earned when the player defeats the combatant. Add an ability to learn by clicking on Add Ability. The combatant will only be able to use abilities that he already learned at his level when in the game. The start inventory defines the items the combatant will have – and what items the player will get when he defeats this enemy. Add an item by clicking on Add Item. This settings define what item(s) can be stolen from the combatant. You can ignore the AI Controlled setting – this is only used for members of the player group. Any non-player combatant will always be controlled by AI. If a combatant is member of the player group and AI Controlled, the player wont be able to select his battle actions (unless the combatant is the player combatant, i.e. the leader of the player group). Click on Add Battle AI to add a battle AI. We’ll take a closer look at animations when it comes to animating battles, for now we’ll only stick to the simple stuff. That’s it for this combatant. Copy Evil Pants and change the following settings. Let’s edit the enemies status values. Add another ability by clicking on Add Ability. Copy Evil Caster and change the following settings. That’s it for the combatants – click on Save Settings. And that’s it for now – the next lesson will cover the first battle.